DESCRIPTION – .75 inch Flat Eyelet Lace, pink-white. DESCRIPTION – .75 inch Flat Eyelet Lace, red-white. DESCRIPTION – .75 inch Flat Eyelet Lace, yellow-white. $0.30 ea. $0.21 ea. $0.18 ea. $0.15 ea. $0.135 ea. $0.128 ea. $0.12 ea. $0.113 ea. DESCRIPTION – 1 inch Flat Eyelet Lace, natural. $0.38 ea. $0.266 ea. $0.228 ea. $0.190 ea. $0.171 ea. $0.162 ea. $0.152 ea. $0.143 ea. DESCRIPTION – 1 inch Flat Eyelet Lace, yellow-white. 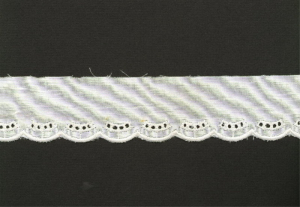 DESCRIPTION – 1.25 inch Flat Eyelet Lace, mint-white. $0.45 ea. $0.315 ea. $0.270 ea. $0.225 ea. $0.203 ea. $0.191 ea. $0.180 ea. $0.169 ea. DESCRIPTION – 1.375 inch Flat Eyelet Lace, wedgwood blue-white. $0.53 ea. $0.371 ea. $0.318 ea. $0.265 ea. $0.239 ea. $0.225 ea. $0.212 ea. $0.199 ea. 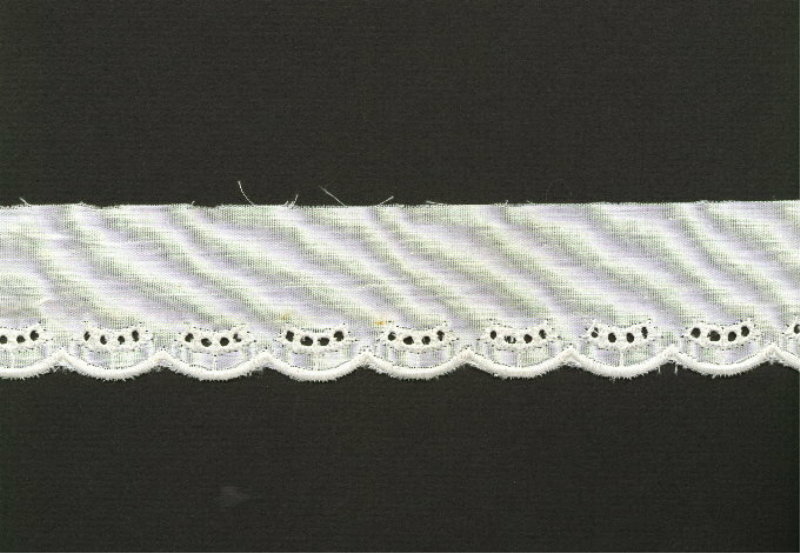 DESCRIPTION – 1.75 inch Flat Eyelet Lace, mint-white. $0.22 ea. $0.208 ea. $0.196 ea. $0.208 ea. DESCRIPTION – 1.75 inch Flat Eyelet Lace, natural. $2.25 ea. $1.575 ea. $1.350 ea. $1.125 ea. $1.013 ea. $0.956 ea. $0.900 ea. $0.844 ea. DESCRIPTION – 7 inch Flat Eyelet Lace, rust.